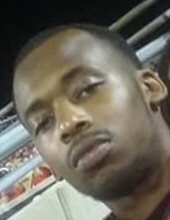 Celebrating the life of Darryl Edmond King Jr.
Obituary for Darryl Edmond King Jr.
King, Darryl Edmond, Jr., 26, of Louisville died Thursday April 4, 2019 at Sts. Mary & Elizabeth Hospital. He was an employee of the Ford Motor Co. and a member of St. Stephen Church. He is survived by a daughter Cherish M. King; a son Darryl S. King; his mother Yvonne L. Rankins his father Darryl E. King, Sr.; two sisters Margaret M. Moore and Alonna D. King. His funeral service will be held 11:00 a.m. Friday April 12, 2019 at St. Stephen Church 1018 So. 15th Street, with burial in Green Meadows Cemetery. Visitation will be 6:00 to 9:00 p.m. Thursday at the church. To send flowers or a remembrance gift to the family of Darryl Edmond King Jr., please visit our Tribute Store. "Email Address" would like to share the life celebration of Darryl Edmond King Jr.. Click on the "link" to go to share a favorite memory or leave a condolence message for the family.